Saudi Arabian Airlines Saudia ( '), also known as Saudi Arabian Airlines''', is the national carrier airline of Saudi Arabia, based in Jeddah. The airline's main operational base is at King Abdulaziz International Airport in Jeddah, King Khalid International Airport in Riyadh and King Fahd International Airport in Dammam are secondary hubs. The airline is the third largest in the Middle East in terms of revenue, behind Emirates and Qatar Airways. 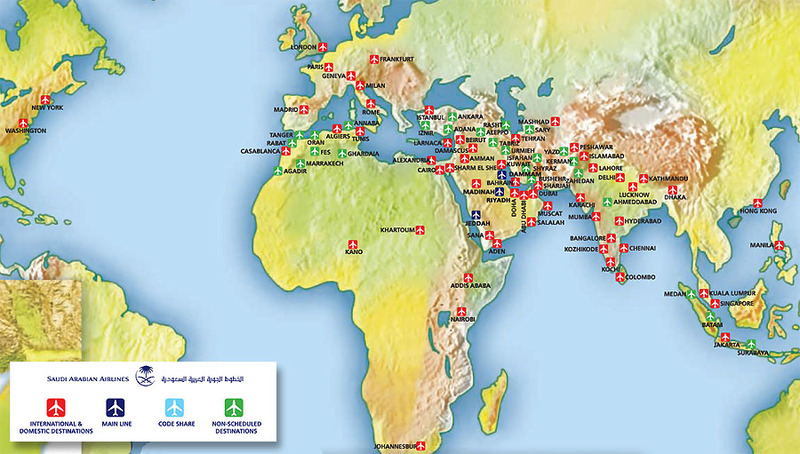 It operates domestic and international scheduled flights to over 85 destinations in the Middle East, Africa, Asia, Europe and North America. Domestic and international charter flights are operated, mostly during the Ramadan and the Hajj season. Saudia is a member of the Arab Air Carriers Organization and joined the SkyTeam airline alliance on 29 May 2012.